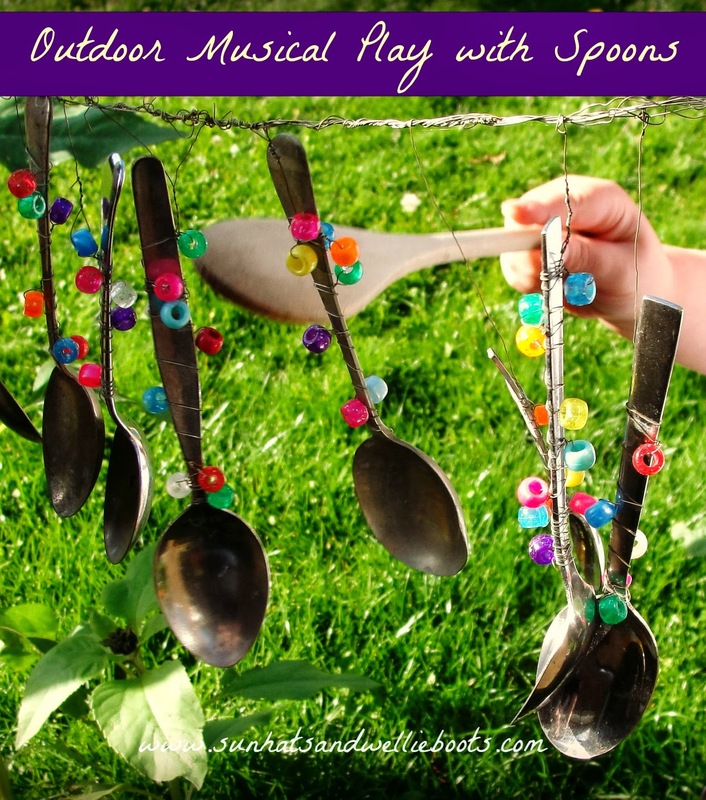 Add a little colour, & creativity to your backyard with this outdoor music station! 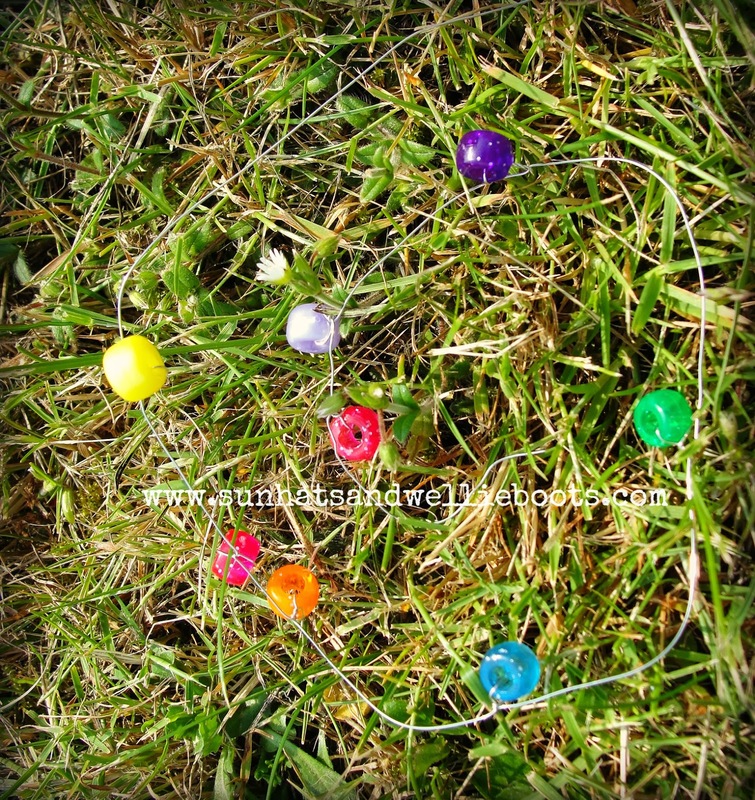 Very simple to make & lots of fun to explore. We love hunting for pre-loved items in charity shops that we can turn into something new. 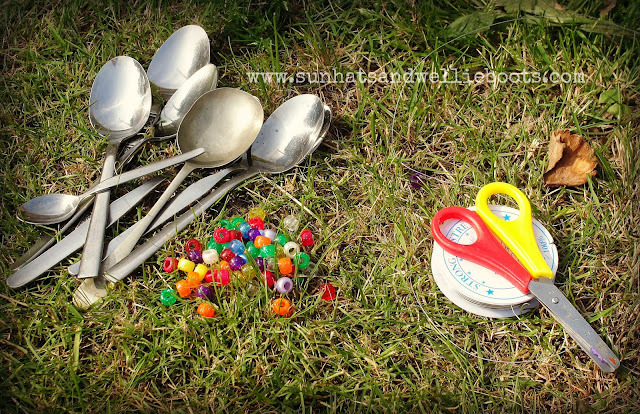 On a recent visit we found a bag of spoons which were just perfect for this activity. I added some thin wire & pony beads & we were all set to decorate them! I cut a long length of wire & Minnie started to thread on her chosen beads. After threading each one she twisted the wire to secure it before threading the next bead on. 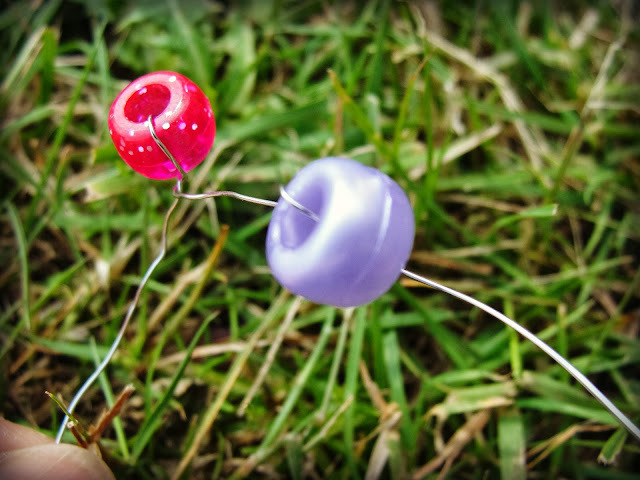 The thin wire made it easy for her to thread the beads & was easy to manipulate. 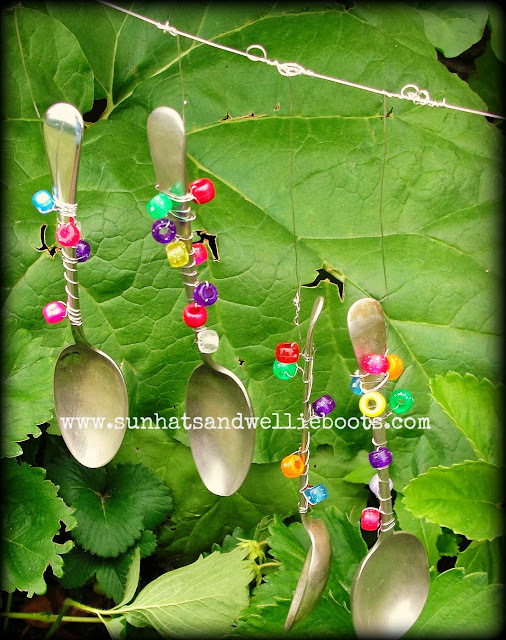 When she had finished adding her beads I attached the wire to the spoon by twisting one end several times around the handle, & then Minnie wound the wire around the rest of the handle. 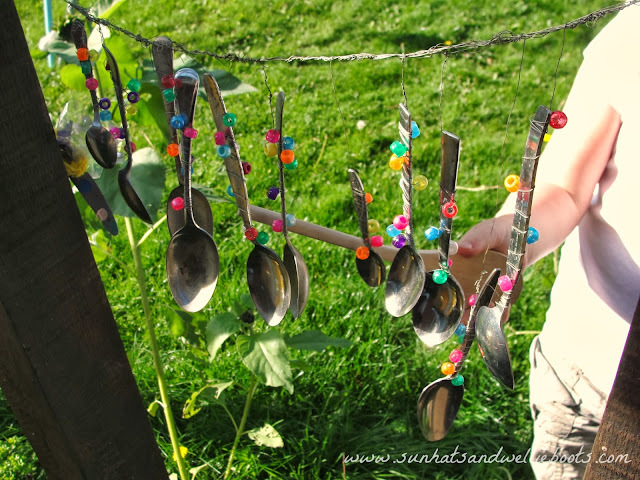 When she got near the top I secured the wire by winding it tightly several times & leaving a length of wire so we could attach it to the other spoons later. 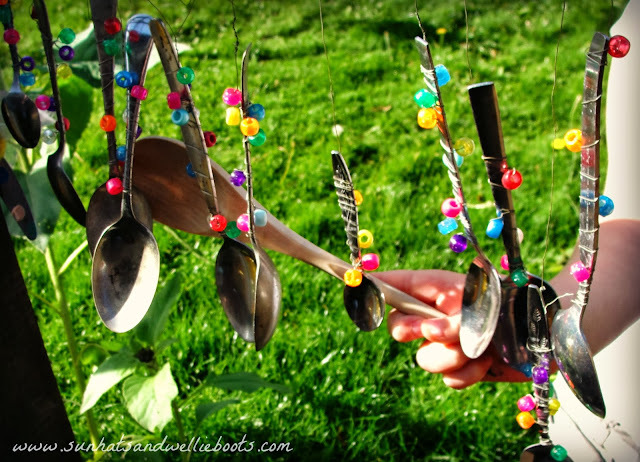 After she had decorated a few more spoons I secured a length of the wire between two wooden posts in our garden & Minnie wound the wire from each spoon around it. They looked so beautiful & bright glistening in the Autumn sunshine. 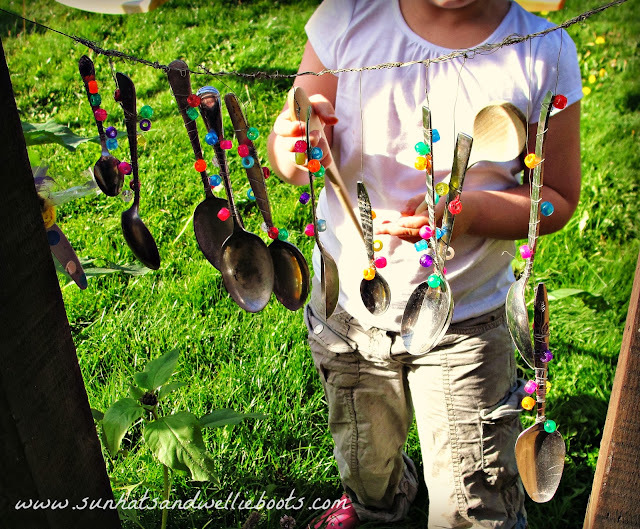 In order to play our new musical outdoor station Minnie added a couple of wooden spoons! Soon she was tapping & scraping the musical spoons & exploring the different sounds they produced as they hit the wooden ones & knocked into each other. The wooden spoons also encouraged some great gross motor moves as she excitedly swung the spoons from side to side along the metal to create a tune! They later enabled some hand-eye co-ordination too as she tapped individual spoons to produce a rhythm. Not only have these colourful spoons brightened up our garden, they've provided a musical area to explore whatever the weather! Great for discovering & identifying a range of sounds & encouraging creativity. What a neat way to 'play the spoons' & turn some discarded cutlery into outdoor art!